The Green squad defeated the White squad by the score of 55-36 at the Summit Tigers girls rugby team's annual Green-White intrasquad scrimmage in late August at Tiger Stadium in Breckenridge. In the time since, the Tigers have won all four of their tournaments to start the season leading up to a massive event at the Pink 7s in Salt Lake City this weekend. At about 1:30 p.m. on Thursday near Rifle, 45 members of the Summit High School girls rugby program were shepherded back onto a charter bus by head coach Karl Barth. 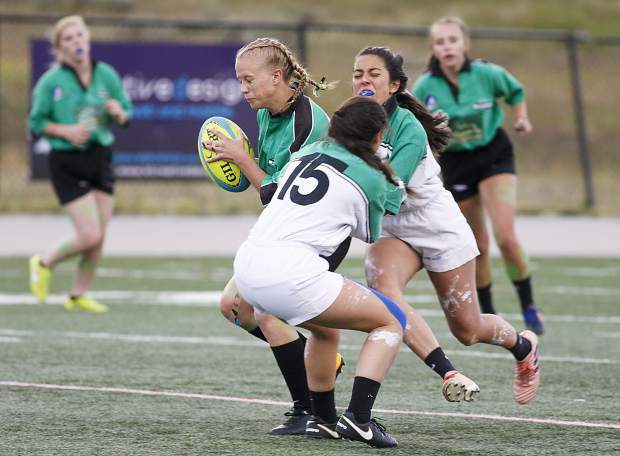 The Tigers were a little over a quarter of the way into their 400-mile trip to Park City, Utah, for one of their biggest competitions of the season: Utah Youth Rugby’s Pink 7s. Over the past three years, the elite tournament in Salt Lake City has become an annual stop for Summit on their autumn campaigns. The Tigers are also a part of the event’s history, having won the inaugural edition in 2015. In the two years since, Summit’s friendly inter-state rival United Girls Rugby of Utah County has took home the title on its home turf. This year, five weeks after Summit topped United in an instant-classic game to win their home Summit 7s tournament, the Tigers travel to Utah with four tournament titles to their name and ready to take on more elite national competition from Utah and Idaho. From their top varsity-level side to their two lower-level squads, the Tigers brought each and every member of the program who could make it on this Utah trip. Only about a half dozen girls won’t suit up on Friday and Saturday, due to illness or previous personal or family obligations. As for Summit’s top side, the Tigers varsity followed up early-season tournament victories at home and down at the Palmer 7s at the U.S. Air Force Academy with further dominance at the Chapparal 7s on Sept. 29 and at the Evergreen 7s on Oct. 6. Across those two meets, Summit’s top side swept all eight of its matches, including a 34-7 win versus Arapahoe in the Chapparal title game and a 26-7 victory versus Monarch in the Evergreen final. Despite the wins, the Evergreen tournament proved to be a different kind of a test for Summit. The Tigers struggled early in Evergreen due to absences stemming from individual injuries and SAT testing. Those personnel voids left Summit without a few key players, namely All-State selections P.K. Vincze and Clara Copley as well as a top-notch and vital member of the team in Heidi Anderson. Without that experienced trio, Summit leaned on another experienced all-state player in CeCe Pennell to not only create scoring opportunities, but to finish them. Abby Daughtery, a 2017 second team all-state selection, also played well at Evergreen, particularly in the final when she made her presence known all over the pitch. With Vincze, Copley and Anderson back in the fold full-time, the Tigers should benefit from Copley’s trademark leadership and heart, Vincze’s in-game versatility and awareness and Anderson’s physicality. Anderson’s style of play at a position — prop — where Summit lacks depth should come in handy versus five other elite western U.S. sides who are not afraid to mix it up and scrap. One of those tenacious teams is United. If the Tigers are to top the two-time defending Pink 7s champions for the second time this season, it will take the same recipe that worked in early September at Tiger Stadium.